The most common nuclide used in modern HDR afterloading machines presently is Ir-192, however, use of Co-60 is increasing. The dimensions of the modern sources of these two isotopes are almost identical. 1 Due to the lower specific activities achievable for Co-60 the available sources typically have a lower activity of around 74 GBq (in comparison to 370 GBq for Ir-192). Nevertheless, treatment times required for 74 GBq Co-60 is only 1.8 times longer than that of a comparable 370 GBq Ir-192 due to the higher air kerma rate constant Γ∂ (around 0.306 μGyh -1 m 2 /MBq for Co-60 sources in comparison to 0.099-0.11 μGyh -1 m 2 /MBq for the commercially available Ir-192 sources. ). Dose distributions for Co-60 and Ir-192 are nearly identical,  so that Co-60 may be an attractive alternative to Ir-192. The advantage of Co-60 is its longer half-life of over five years in comparison to 74 days for Ir-192 so that Co-60 sources need to be replaced only at periods of several years. This may reduce effort and costs for source transport, purchase and disposal and for quality assurance. On the other hand Co-60 requires increased radiation shielding. The longer useful half-life makes Co-60 sources especially interesting for developing countries. Recommendations for dosimetric verification of air kerma strength for afterloading sources are given in IAEA-TECDOC 1274,  AAPM Report 41,  for Germany in DIN 6809-2  in combination with DGMP Report 13  and in ESTRO Physics booklet No.8. While DGMP Report 13 and the ESTRO physics booklet  (which is not used in this work) describe measurements using a thimble ionization chamber free in air and in a PMMA solid phantom and using a well-type chamber the other two reports only give recommendations for measurements free in air and with a well chamber. Dosimetric parameters to calculate air kerma rate from instrument reading for the measurement of Ir-192 are given in DGMP Report 13, in IAEA-TECDOC 1274 and in the ESTRO physics booklet, while in AAPM Rept. 41 they are missing. None of the protocols is intended for calibration of Co-60 sources and therefore none provides these parameters for Co-60. Dosimetry was performed according to all three protocols mentioned above. Ir-192 measurements were performed with the Nucletron afterloader while Co-60 measurements were performed with the Bebig Multisource afterloading machine which can operate both Ir-192 and Co-60 sources. The measurements were performed within a time period of about one year with 4 different Ir-192 and 2 Co-60 sources at three different institutions. Two different thimble chambers (M31013 and M23331, both PTW, Freiburg) and one well-type chamber (077.094-25208, PTW Freiburg) were used for the measurements. All chambers were calibrated at the PTW Freiburg secondary standard laboratory. Chambers were calibrated in terms of absorbed dose to water (N w ), in air kerma (N k ) and in exposure (N x ) following the three dosimetry protocols. ,, Thimble chamber calibration factors N w , were specified for Co-60 together with a radiation quality correction factor k Q for 250 kV X-rays while N k and N x were provided for Co-60, Cs-137 and 250 kV X-rays. The well-type chamber was calibrated directly in terms of reference air kerma rate or exposure rate both for Co-60 and Ir-192. Measurements were performed with a UNIDOS E electrometer (PTW Freiburg) in electrical units (nC or nA). The free-in air measurements were performed with the M23331 chamber (chamber volume 1 cm 3 ), measurements in the PMMA phantom with the M31013 chamber (0.3 cm). This section describes the measurement of the reference air kerma rate at 1m distance in air. Some publications specify air kerma rate in vacuo. , This difference is not corrected for in this work. Integration time, i.e. the dwell time of the source in the measuring position for measurements free-in-air and in the PMMA phantom was always 3 mins. Transfer time from and back to the after loader is not accounted for. Immediately before each series of free-in-air or well chamber measurements the dwell position providing maximal dose rate was determined, and used in the following measurements. In the free-in-air and well chamber measurements the reading introduced in the evaluation of air kerma rate was determined as the average charge collected for five measurements. The reading of the well type chamber was the electrical current after arriving at a constant value. These measurements were performed only once after verifying that the maximum dose rate does not change for repeated measurements. The readings were introduced into the following formulae to calculate reference air kerma rate. In the formulae the abbreviations for factors are explained only at their first occurrence. [Figure 1] shows the set-up for the cylindrical PMMA phantom 9193 (diameter 20 cm, length 13 cm) together with the Bebig after loader during measurements for a Co-60 source. An insert in the centre accommodates a needle in which the source is positioned. Four additional inserts measuring probes are placed symmetrically with their centre at 8cm distance from the phantom axis. Four measurements are performed, in which the ionization chamber is alternately positioned in each insert. The remaining bores are filled with dummy inserts. k zp : is a correction factor accounting for the differences in scatter and absorption in the PMMA phantom surrounding the measuring probe in comparison to free-in-air conditions. This factor is also referred to in the remaining text as the phantom calibration factor. Values for the factors used in this work are given in [Table 2],[Table 3] and [Table 4]. 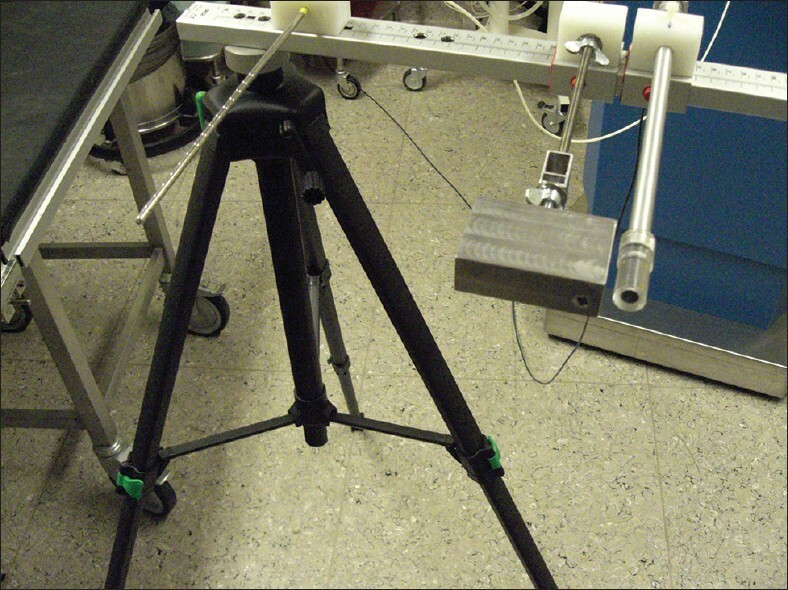 Source and ionization chamber are positioned on a calibration jig shown in [Figure 2]. On the jig the distance source-chamber can be varied at continuous positions between 5 and 80 cm by moving the chamber holder on a rail. A mm scale allows adjusting the distance between chamber axis and source axis within an uncertainty of 0.5 mm. A second holder on the rail allows mounting a lead block between chamber and source which is used to absorb direct radiation from the source and thus measure the scatter radiation component in the air kerma measurement. The block has the same height as the sensitive volume of the ionization chamber (plus Co-60 build-up cap) and a shielding thickness of 7 cm. The block is placed immediately next to the ionization chamber. All free-in-air measurements were performed with a Co-60 build-up cap. N k : Calibration factor of ionization chamber in terms of air kerma. N k for Ir-192 was calculated by the equation given in [Table 3] (as recommended by IAEA-TECDOC 1274). N x : Calibration factor of ionization chamber in terms of exposure. N x for Ir-192 was calculated by the equation given in [Table 3] (as recommended by IAEA-TECDOC 1274). The "exposure gradient (displacement) correction P grad" recommended in AAPM Report 41 is set to 1.0 in this work. Set-up for the well chamber measurements is identical in both protocols [Figure 3]. The chamber was positioned at large distance from any wall or large object in order to reduce scatter radiation as far as possible. The measurements were performed in a dedicated source holder for each type of source (for the Nucletron Ir-192 source: T33002.1 and for the Bebig Co-60 source: T3304.1, both PTW Freiburg) at the dwell position in the chamber producing the maximal ionization current (the "sweet spot"). In the measurements the identical source holder (type and serial no.) must be used as for calibration of the well chamber. Measurements were performed in current mode of the electrometer after achieving a constant current. In contrast to DIN 6809-2 and IAEA-TECDOC 1274, AAPM Rept. 41 requires a well-type chamber which is calibrated in terms of exposure. DIN 6809-2 uses the calibration factor for Co-60 for both isotopes and corrects the Ir-measurements for differing radiation quality with a factor k Q = 1.0. IAEA  and AAPM  recommend interpolating the Ir-192 calibration from calibration factors for 250 kV x-rays and Co-60 gamma radiation as shown in [Table 3]. A number of corrections must be determined for the individual ionization chamber. Their calculation and values are listed in [Table 4]. The well-type chambers are individually calibrated for each isotope. While DIN 6809-2 (Rept. 13) and IAEA-TECDOC 1274 give recommendations for all correction factors for Ir-192, some are missing in AAPM Rept. 41. None of the protocols gives any correction factors for Co-60. These were therefore taken from scientific literature ,, . Where no published factors were found, either the values recommended for Ir-192 by DIN 6809-2 or IAEA-TECDOC 1274, or where applicable, were set equal to 1 (AAPM Rept. 41). The sources were repeatedly measured on different days. On each day the measured reference air kerma rates were recalculated to the equivalent rate at the time of calibration as indicated in the source certificate. Then the differences between measured and certified air kerma rates were averaged separately for each protocol. The variance of the measurements additionally indicates the reproducibility of each method. Mean deviations from the certified calibration and the variation of the measurements are shown as fat bars in [Figure 4], the error bars indicate the variation of repeated measurements. All protocols and methods of measurement show agreement with the certified air kerma rates within maximally 1.2% for Ir-192 and 2.5% for Co-60. First measurements on Bebig Co-60 sources were published by Andrassy and Grundei in 2006  and 2008  after introduction of the new Bebig afterloader. In this work the authors also determined the Co-60 phantom calibration factor k zp for the Krieger PMMA phantom. 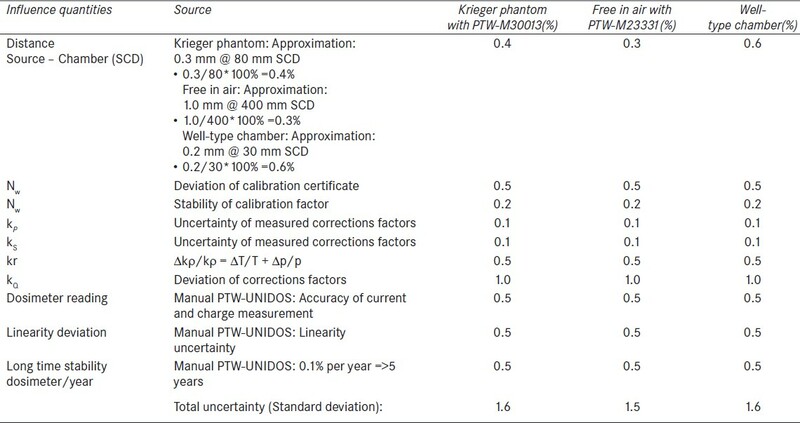 These measurements also deviated from the certified values by ±2% and therefore confirm our measurements in the Krieger phantom where we obtained deviations of 1.6%. Our Co-60 measurements free in air deviate from the certificate by 2.5%, the well chamber measurements by 0.8%. In the experiments, free in air the scatter radiation component was determined by a second measurement using a scattering block which was then subtracted from the measurement without absorber. The scatter contribution was dependent on the position of source and ionization chamber and their distance from any wall or massive object. For Ir-192 it amounted to around 2% (corresponding to a correction factor k scatt = 0.98) and for Co-60 around 4% (k scatt = 0.96). For the measurements in the PMMA phantom and using the well-type chamber, scatter contributions can be neglected provided the distances to walls and massive objects are large enough (generally >1.5 m). Free in air measurements require a minimum ionization chamber volume of 1 cm 3 . Whether or not a build-up cap should be used is discussed controversial in literature. DGMP Rept.13 and IAEA-TECDOC 1274 recommend the use of a Co-60 build up cap both for Co-60 and for Ir-192. The uncertainties in these measurements are summarized in [Table 6]. The uncertainties of any quantity were either taken from the specifications of the respective manufacturer, the recommendations in the protocols or calculated as standard deviations of repeated measurements. The total uncertainty is calculated as the root square sum of the individual uncertainties. These independently calculated total uncertainties for all three methods agree well with the best practice uncertainties (k = 1) as stated by AAPM Task Group No. 138  for the measurement of S k in the clinic using a well-type chamber. For calibration measurements on Ir-192 using an ionization chamber some protocols recommend to obtain two chamber calibrations (DIN 6809-2  : Co-60 and 250 kV X-rays; AAPM TG 56  : Cs-137 and 250 kV X-rays) in order to calculate the interpolated calibration factor for Ir-192. Since determination of Nk by interpolation will add some increased uncertainty in the air kerma calibration factor for Ir-192, a direct calibration for Ir-192 is desirable as it is provided by the Britisch NPL  and the German PTB. These standard laboratories will provide Ir-192 calibrations in terms of reference air kerma rate for well-type chambers, and for free complete measurement arrangements for free-in air measurement (consisting of ionization chamber, source holder and measurement jig) or complete PMMA phantom arrangements (consisting of ionization chamber, source holder and phantom). Calibrations of other types of ionization chambers in terms of air kerma rate for Ir-192 are so far not available. Well-type chambers have proven to be fast and precise measuring instruments. They are also used for source calibration by the manufacturers. In clinical use the PMMA phantom may have some advantages since it can also be used e.g., to check the calibration of in-vivo probes or for QA tests of the after loading machine. If one has no direct calibration of the phantom arrangement (as provided by PTB  ), one needs to know the phantom calibration factor kzp . In some cases kzp can be obtained from the manufacturer (or from literature), otherwise one needs to determine it by cross-calibration from a measurement of reference air kerma rate using one of the other methods. Calibration factors for the Krieger type PMMA phantom used in this work are available both for Ir-192 and for Co-60. DGMP Report 13 provides guidance for dosimetry of Ir-192 sources for all three methods of measurement (including measurements in the Krieger type PMMA phantom) following the German standard protocol DIN 6809-2 which is dated from 1993 and is outdated in some parts. 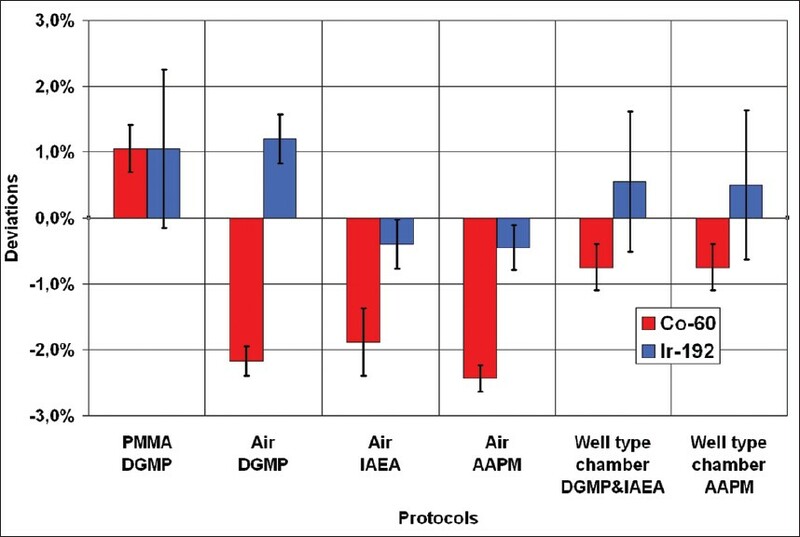 The international protocol IAEA-TECDOC 1274  and AAPM Report 41  give recommendations only for measurements free in air and for the well-type chamber. AAPM Report 41 report (from 1992) is outdated since it still recommends using an ionization chamber calibrated in exposure but is in principle still applicable provided one can obtain a calibration in exposure. This type of calibration has been replaced by calibration in terms of absorbed dose to water in most protocols, including the American AAPM TG 51 protocol for high energy photon and electron beams. AAPM TG 56  recommends measuring Ir-192 source strength using instruments calibrated directly in terms of air kerma however gives no correction factors. It is desirable to agree on an internationally accepted common protocol which describes all methods of calibration using the best available correction factors, and also giving recommendations for Co-60 sources, and possibly also for a number of other nuclides which may be available for high dose rate after loading in the near future. A direct calibration of the chambers for Ir-192 compared to the interpolative method (uncertainty about 2%) showed an uncertainty of 0.8%. , According to AAPM TG 138,  the propagation of uncertainties from the various well-chamber measurements involved in the transfer of the source-strength standard to the clinic results in a minimum expanded uncertainty (k = 2) in SK,CLINIC of 2.56%. Therefore, in clinical practice it is recommendable to use the more precise direct calibration. In the international co-operation EURAMET  several national standard laboratories have collaborated in the project JRP06 brachytherapy in which new standards for the calibration of brachytherapy sources are under development. Within this project methods are being developed to directly measure the absorbed dose to water surrounding brachytherapy isotopes including Ir-192 at distances of a few cm. ,,,,,, As a major result the project has obtained an improved value for the dose rate constant Λ reducing the uncertainty in source specification (in reference air kerma rate) from previously ±5% to around ±2% (k = 2). Source specification directly in terms of absorbed dose to water is not planned. If this were the case the same methods of source verification could be used. With these standards it would however be necessary to determine new calibration factors for the instruments in terms of absorbed dose to water. Dose calculations with such a specification could be performed in the same manner as today, since in the AAPM TG-43 formalism , the product is equal to the dose rate in water under reference conditions. The remaining formalism could be used without changes since all factors in the calculation are defined already in terms of absorbed dose to water. 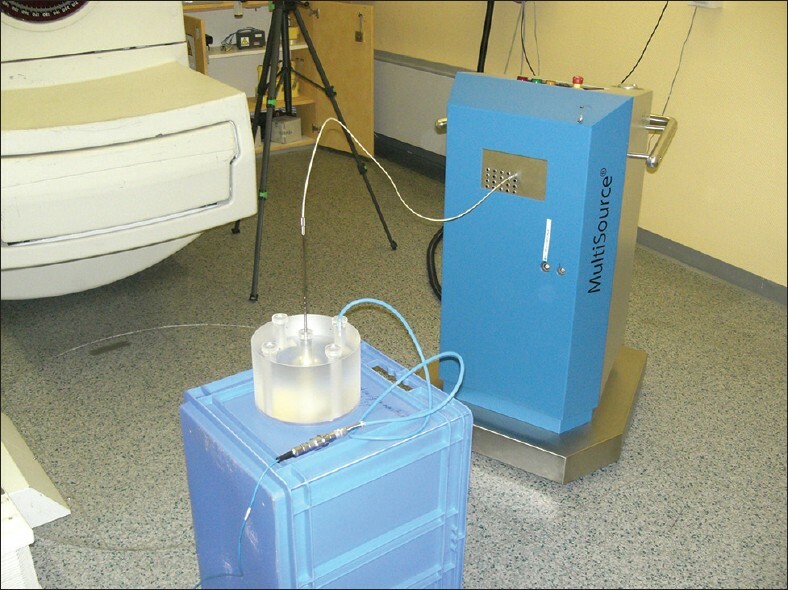 Verification of source calibration of Co-60 HDR brachytherapy sources by the clinical user is feasible. Source strength for Co-60 sources can be measured with comparable uncertainty using the same instruments with the same dosimetry protocols as used for the more common Ir-192 sources. 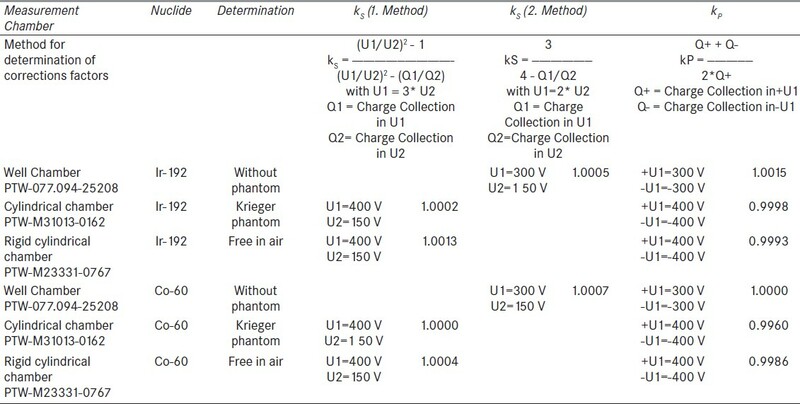 The correction factors to calculate air kerma rate from the reading of calibrated ionization chambers for Co-60 can be taken from literature. Since dose distributions for Co-60 are very similar to those for Ir-192,  Co-60 brachytherapy sources may be an attractive and cheaper alternative to the existing Ir-192 sources. 1. Nath R, Anderson LL, Luxton G, Weaver KA, Williamson JF, Meigooni AF. Dosimetry of interstitial brachytherapy sources: Recommendations of the AAPM Radiation Therapy Committee Task Group No. 43. Med Phys 1995;22:209-234. 2. Rivard MJ, Coursey BM, DeWerd LA, Hanson WF, Huq MS, Ibbott, GS, et al. Update of AAPM Task Group 43 Report: A revised AAPM protocol for brachytherapy dose calculations. Med Phys 2004;31:633-74. 3. IAEA-TECDOC-1274. Calibration of photon and beta ray sources used in brachytherapy. Vienna: International Atomic Energy Agency; 2002. 4. DIN 6809-2. Klinische Dosimetrie: Brachytherapie mit umschlossenen gammastrahlenden radioactiven Stoffen. Berlin: Deutsches Institut für Normung; 1993. 5. DGMP-Bericht 13. Praktische Dosimetrie in der HDR-Brachytherapie (1999), korrigierte Version 2006. Berlin: Deutsche Gesellschaft für Medizinische Physik (German Society for Medical Physics); 2006. 6. Bidmead M, Briot E, Burger J, Ferreira I, Grusell E, Kirisits C, et al. European Guidelines for Quality Assurance. In: Venselaar J, Perez-Calatayud J, editors. 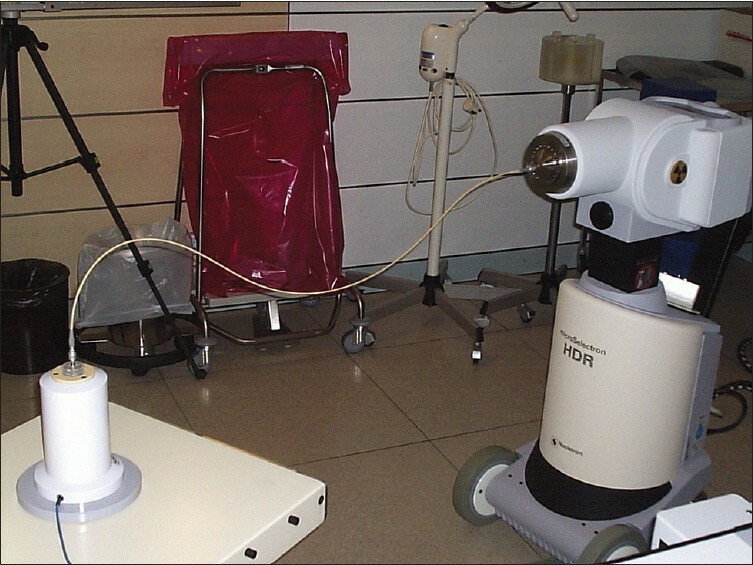 Radiotherapy, A practical guide to Quality Control of Brachytherapy Equipment. ESTRO Booklet No 8. Brussels: European Society for Radiotherapy and Oncology; 2004. 7. International Commission on Radiation Units and Measurements. Dose and volume Specification for Reporting Intracavitary Therapy in Gynaecology. ICRU Report 38. Bethesda: International Commission on Radiation Units and Measurements; 1985. 8. International Commission on Radiation Units and Measurements. Dose and volume Specification for Reporting Interstitial Therapy. ICRU Report 58. Bethesda: International Commission on Radiation Units and Measurements; 1997. 9. Zakaria GA, Schütte W. Dosimetrie in der HDR-Afterloading-Brachytherapie mit Ir-192 und Co-60: Vergleich verschiedener internationaler Dosimetrieprotokolle. DGMP-Tagung Oldenburg, 2008. Available from: http://www.dgmp2008.de [Last accessed on 2011 Jun 30]. 10. Baltas D, Sakelliou L, Zamboglou N. The Physics of modern Brachytherapy for Oncology. New York, London: Taylor and Francis; 2007. 11. Richter J, Baier K, Flentje M. Comparison of Co-60 and Ir-192 sources in high dose rate afterloading brachytherapy. Strahlenther Onkol 2008;184:187-92. 12. Glasgow GP, Bourland JD, Grigsby PW, Meli JA, Weaver KA. A Report of AAPM Task Group No. 41 Remote After loading Technology. Madison: American Association of Physicists in Medicine by the American Institute of Physics; 1993. 13. Suntharalingam N, Podgorsak EB, Tölli H. Brachytherapy: Physical and Clinical Aspects. In: Podgorsak, EB, editor. Review of Radiation Oncology Physics: A Handbook for Teachers and Students. Vienna, Austria: International Atomic Energy Agency; 2003. p. 371-96. 14. Baltas D, Geramani K, Ioannidis GT, Hierholz K, Rogge B, Kolotas C, et al. Comparison of calibration procedures for Ir-192 Brachytherapy sources. Int J Radiat Oncol Biol Phys 1999;43:653-61. 15. Andrassy M. Acceptance Test of Co-60 HDR-Afterloading Sources by Means of In-Phantom Measurement. Eckart and Ziegler BEBIG GmbH; 2008. 16. Grundei B, Andrassy M. Eingangsdosimetrie an einer Co60-Afterloadingquelle. Poster, DGMP-Tagung Regensburg; 2006. 17. Zakaria GA, Schütte W, Azhari HA. Dosimetrie an HDR-Afterloading-Geräten mit Ir-192- und Co-60-Strahler: Vergleich verschiedener internationaler Dosimetrieprotokolle. Z Med Phys 2010;20:215-24. 18. Reich H (Hrsg.). Dosimetrie ionisierender Strahlung. Stuttgart: Teubner BG; 1990. p. 87-94. 19. Zeng J. Clinical Dosimetry of High-energy Photons in Brachytherapy, Master thesis, Joint Master's Course of Biomedical Engineering to Martin-Luther-University Halle-Wittenberg and Anhalt University of Applied Sciences, Köthen; November 2009. 20. Kondo S, Randoplph ML. Effect of finite Size of Ionisation Chambers on Measurement of small Photon Sources. Radiat Res 1960;13:37-40. 21. Zakaria GA, Schütte W, Radant J. Dosisleistung und Dosisverteilung eines Ir-192-Strahlers beim Buchler-Afterloading-Gerät. Z Med Phys 1993;3:35-40. 22. Goetsch, SJ, Attix FH, Pearson DW, Thomadsen BR. Calibration of 192 Ir high-dose-rate Afterloading Systems. Med Phys 1991;18:462-7. 23. DeWerd LA, Ibbott GS, Meigooni AS, Mitch MG, Rivarda MJ, Stump KE, et al. A dosimetric uncertainty analysis for photon- emitting brachytherapy sources: Report of AAPM Task Group No. 138 and GEC- ESTRO. Med Phys 2011;38:782-801. 24. Treatment planning system Bebig HDRplus User's Guide and Tutorial, Version 2.2, Berlin, Germany. 25. Nath R, Anderson LL, Meli JA, Olch AJ, Stitt JA, Williamson JF. Code of practice for brachytherapy physics: Report of the AAPM Radiation Therapy Committee Task Group No. 56. Med Phys 1997;24:1558-98. 26. Available from: http://www.npl.co.uk/ionising-radiation/dosimetry/products-and-services/photon-beam-calibration-service-for-radiotherapy-(air-kerma-and-absorbed-dose [Last accessed on 2011 Jun 30]. 27. Available from: http://kcdb.bipm.org/appendixC/country_list_search_RI.asp?CountSelected=PTB;7;-;7;-,PTB;7;-;9;-,PTB;7;-;12;-and branch= 1 and quantity= 7 and country_sel=DE [Last accessed on 2011 Jun 30]. 28. Almond PR, Biggs PJ, Coursey BM, Hanson F, Huq MS, Nath R, et al. AAPM's TG-51 protocol for clinical reference dosimetry of high-energy photon and electron beams. Med Phys 1999;26:1847-70. 29. Douysset G, Gouriou J, Delaunay F, Deward L, Stump K, Micka J. Comparison of dosimetric standards of USA and France for HDR brachytherapy. Phys Med Biol 2005;50:1961-78. 30. Douysset G, Sander T, Gouriou J, Nutbrown R. Comparison of air kerma standards of LNE-LNHB and NPL for Ir-192 HDR Brachytherapy sources: EUROMET project no 814. Phys Med Biol 2008;53:N85-97. 31. EURAMET: Publishable JRP Summary for Project T2 J06 (JRP Brachytherapy). Increasing cancer treatment efficacy using 3D brachytherapy, November 2008. Available from: http://www.euramet.org/index.php?id=imera-plus [Last accessed on 2011 Jun 30]. 32. De Werd LA. Calibration for brachytherapy sources. In: Thomadson BR, Rivard MJ, Butler WM, editors. Brachytherapy Physics Second Edition, Proceedings of the Joint AAPM/ABS Summer School, Seattle University, Seattle, Washington July 18- 22, 2005. Medical Physics Monograph No.31. Madison: American Association of Physicists in Medicine; 2005. p. 153-72. 33. Rivard MJ, Venselaar JL, Beaulieu L. The evolution of brachytherapy treatment planning. Med Phys Vision 2020 Collection. Med Phys 2009;36:2136-53. 34. Bambynek M, Krauss A, Seelbach HJ. Kalorimetrieche Bestimmung der Wasserenergiedosis im Nahfeld von Ir-192-Brachytherapiequellen. DGMP-Tagung, Oldenburg 2008. Available from: http://www.dgmp2008.de. [Last accessed on 2011 Oct 21]. 35. Bovi M, Toni MP, Aubineau-LI, Bordy JM, Cardoso J, Chauvenet B, et al. Traceability to absorbed-dose-to-water primary standards in dosimetry of brachytherapy sources used for radiotherapy. Proceedings XIXth IMEKO World Congress, "Fundamental and applied metrology" Lisbon; 2009. p. 1674-79. 36. Sarfehnia A, Kawrakow I, Seuntjensa J. Direct measurement of absorbed dose to water in HDR 192Ir brachytherapy: Water calorimetry, Ionization chamber, Gafchromic film and TG-43. Med Phys 2010;37:1924-32. 37. Selbach HJ. Experimental determination of the dose rate constant for selected 125 I and 192 Ir brachytherapy sources. Conference on Advanced Metrology for Cancer Therapy (CAMCT), 29.11.-01.12.2011, PTB Braunschweig, Germany. Available from: http://www.ptb.de/CAMCT [Last accessed on 2011 Dec 15]. Gambarini, G., Carrara, M., Tenconi, C., Pignoli, E., Rosenfeld, A.